The presidency has appealed to the President of the Senate, Dr. Bukola Saraki, and the Speaker of the House of Representatives, Hon. Yakubu Dogara, to reconvene the National Assembly in order to expeditiously consider several urgent matters pending before it. The Senior Special Assistant to the President on National Assembly Matters (Senate), Senator Ita Enang, made the appeal at a press conference in Lagos at the weekend, saying the lawmakers needed to urgently consider some important pending issues in national interest. 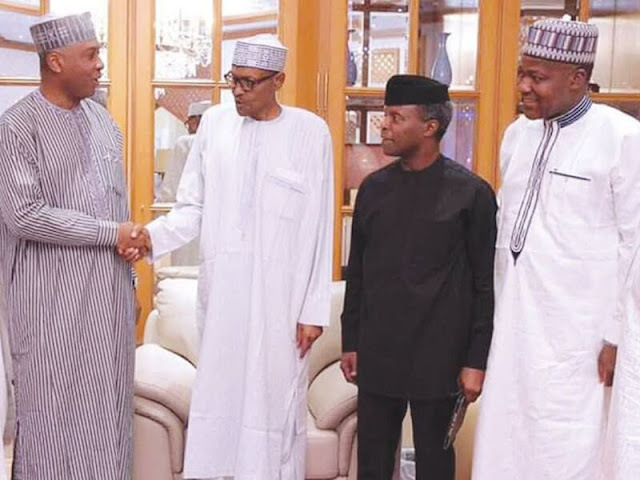 The presidential aid said if the National Assembly is not reconvened immediately, it might adversely affect the country, particularly with respect to the 2019 general election, the budget for which is pending before the federal legislature. But the acrimony between the ruling All Progressives Congress (APC) and the leading opposition Peoples Democratic Party (PDP) seems determined to jeopardise the presidency’s appeal as both parties remained at each other’s jugular yesterday. While the PDP accused the APC-led federal government of plotting to forcefully reconvene the National Assembly with a view to effect leadership change, the ruling party insisted that Saraki having defected to the opposition party must step down as the president of the Senate. He warned that the lawmakers’ holiday, which started on July 24 and ends on September 5, might stall the allocation of funds to critical sectors of governance and the economy. The supplementary funds would enable the Independent National Electoral Commission (INEC) to commence preparations for the 2019 polls, he said. Also pending are several key appointments for the Economic and Financial Crimes Commission (EFCC), Independent Corrupt Practices and Other Related Offences Commission (ICPC), Deputy Central Bank of Nigeria (CBN) Governor and Assets Manacement corporation of Nigeria (AMCON), Code of Conduct Berau among others. Saraki had announced the adjournment at plenary following a motion on alleged siege to his home and that of the Deputy Senate President Ike Ekweremadu by security operatives. Enang also appealed to party leaders and various caucuses in the National Assembly to prevail on their leadership to reconvene to treat pending pressing issues which needed urgent attention. He added that though the lawmakers were entitled to holiday and vacation, their rules permit them to reconvene where there are urgent and pressing national issues to deal with.